Rugby Australia has announced that it intends to terminate the contract of Israel Folau following an anti-gay social media post. 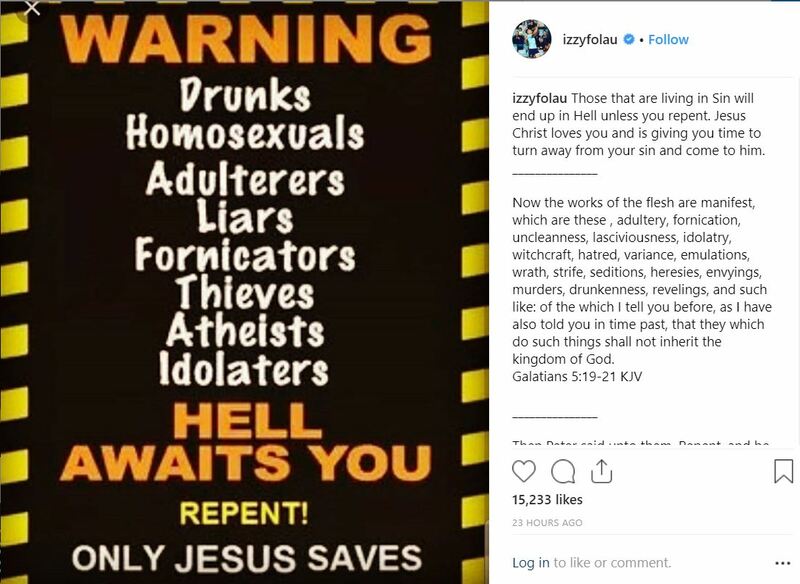 The 30-year-old posted an image to Instagram this week saying that for gay people, "hell awaits you". It is not the first time that the Australian international has expressed such an opinion. Rugby Australia and the New South Wales Rugby Union have made repeated attempts to contact Israel both directly and via his representatives since 6.30pm on Wednesday, and at this point he has failed to communicate directly with either organisation. Whilst Israel is entitled to his religious beliefs, the way in which he has expressed these beliefs is inconsistent with the values of the sport. We want to make it clear that he does not speak for the game with his recent social media posts. Israel has failed to understand that the expectation of him as a Rugby Australia and NSW Waratahs employee is that he cannot share material on social media that condemns, vilifies or discriminates against people on the basis of their sexuality. Rugby is a sport that continuously works to unite people. We want everyone to feel safe and welcome in our game and no vilification based on race, gender, religion or sexuality is acceptable and no language that isolates, divides or insults people based on any of those factors can be tolerated. As a code we have made it clear to Israel formally and repeatedly that any social media posts or commentary that is in any way disrespectful to people because of their sexuality will result in disciplinary action. In the absence of compelling mitigating factors, it is our intention to terminate his contract. See Also: Why Do Munster Keep Shouting 'Oompa Loompa'?